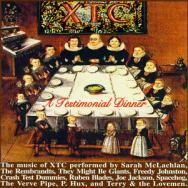 Chalkhills: Reviews: "A Testimonial Dinner - The Songs of XTC"
. . . DINNER is yummy. It reminds you that underneath the forced lunacy, Andy Partridge isn't a bad songwriter. . .
Roster includes: Crash Test Dummies, Joe Jackson, Freedy Johnston, Sarah McLachlan, and They Might Be Giants. Expectations: Rather high as this quirky British band has such a rich vein of material to draw from. The expectation is somewhat mitigated by a number of lesser-known participants. Standout tracks: Panamanian salsa artist Rubén Blades turns in a jazzy and exciting Latin big-band version of "The Man Who Sailed Around His Soul"; Sarah McLachlan makes "Dear God" more poignant without sacrificing sonic complexity; and They Might Be Giants add an extra dose of flash to "25 O'Clock," the only Dukes of Stratosphear (XTC's wish-it-was-the-sixties alter ego) cut on the album. Results: Having Freedy Johnston cover "Earn Enough for Us" was a perfect choice; the song sounds like something he might have written. But how embarrassing is it to make a point of identifying in the liner notes which XTC album each track was drawn from, and get one wrong? According to the notes, the song was on Black Sea, when it was actually on Skylarking. The lack of care extends to the music, too. The best tracks on A Testimonial Dinner are outstanding; but if a little more time and care were taken in finding bands for the project, it could have been improved. Cheating? : The heretofore unknown group, Terry & The Lovemen, cover "The Good Things," on this disc, and they come strikingly close to the trademark XTC sound. No wonder, they are XTC, redoing their own song. Nobody can satisfactorily match the complexity, wit and sheer ability of XTC. This selection of artists are only pale imitators even as they try to pay homage to one of the leading bands of the last 15-20 years (minus the four years that Virgin have kept them out of circulation). Verve Pipe, four songs in, are the first to actually get a handle on the sound with Making Plans for Nigel. Then Sarah McLachlan takes a tentative bite at Dear God that works more because of the lyrics than her approach. Ruben Blades puts a mambo beat to The Man Who Sailed Around His Soul and completely reworks it in a cool Latin jazz style. Terry of Terry & the Lovemen has a vocal range that's pretty close to Andy Partridge with The Good Things. Listen then buy. PLEASANT SURPRISE: Sarah McLachlan's winning "Dear God"
APPROPRIATE LYRIC: "Don't need another satellite"
INSPIRED PAIRING: Salsa man Ruben Blades and "The Man Who Sailed Around His Soul." - last line sounds like "I hate that XTC!" GLARING OMMISSION: "It's Nearly Africa" by Paul Simon? WEIRDEST ARRANGEMENT: Terry and the Loveman sound suspiciously like XTC crashing their own testimonial. THEY HAD INFLUENCES, TOO: Oh, I don't know - the Beatles maybe? WHERE ARE THEY NOW? : Not onstage. If imitation is indeed the sincerest form of flattery, then the peerless British band XTC should consider themselves seriously flattered by the release of yet another "tribute" project, A Testimonial Dinner - The Songs Of XTC. Actually, seriously flattened is closer to the truth, as the assemblage of talents performing these otherwise sublime songs fail to convey any nuance associated with the original versions. The only real tribute being paid here is hopefully into the bank account of XTC leader Andy Partridge. There are a few interesting moments to be found (Ruben Blades' salsafied "The Man Who Sailed Around His Soul," Joe Jackson's jaunty "Statue Of Liberty"), but the majority of the covers are woefully inadequate interpretations. When the most remarkable cut on a tribute album belongs to the band under scrutiny (XTC appears here cleverly disguised as "Terry And The Lovemen" with a remake of an Oranges And Lemons period B-side, "The Good Things"), then something has gone fundamentally wrong with the entire concept. The degree of debasement ranges from the merely passable (Crash Test Dummies' "All You Pretty Girls") to bordering on pretension (Sarah McLachlan's ponderous "Dear God"). As XTC has always been a band renowned for its musical and spiritual unpredictability, it is doubly insulting to have to endure slavish rehashes by so-called musicians unworthy of even carrying Mr. Partridge's soiled Y-fronts (i.e., British slang for men's underwear). The boldest offenders are also the wimpiest - Freedy Johnston's lifeless "Earn Enough For Us" and The Rembrandts' laughably flaccid "Making Plans For Nigel." Even They Might Be Giants' contribution ("25 O'Clock" from The Dukes Of Stratosphear era) is missing that special something even approaching inspiration. XTC themselves have been conspicuously absent from the scene since 1992's exquisite Nonsuch due to legal entanglements with Virgin/EMI and their vacancy is indeed felt. Save the money you'd spend on this homogenized and dry-cleaned substitute and go buy digital copies of some of XTC's exemplary back catalog - Drums And Wires, Black Sea, English Settlement, or any other. For those desperate fans who just can't wait any longer for a fix, be forewarned that A Testimonial Dinner - The Songs Of XTC is more agony than XTC - a pale imitation compared to the real thing. - D. D. D.